Whilst surfing the blogosphere. I came across these unique QR code promotional wristbands. These wristbands are innovative and different from the plethora of basic wristbands. For more, keep on reading. This band simply fits onto your wrist. 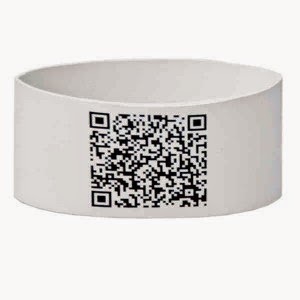 These wristbands deviate from the norm with a QR code being imprinted on the band. Using a Smartphone, the QR code can be scanned and can be linked to various websites. Curiosity is likely to drive the user to find out where the QR code links to. This promotional wristband is a great way to connect with your target market. It can possibly link to your company website, Facebook , Twitter or various other social media channels. This can increase traffic to your website and can improve brand engagement. The QR code could also link to videos or give-aways. These are only some suggestions, however the possibilities of using this are only limited to your creativity. It would be recommended to offer this as a promotional gift, this is so that large sample of people can be targeted. What is your favourite QR Code Swag? Hope this has given you some ideas. Adieu for now.